Barkis is a terrier. Unlike Barnaby's dog, Barkis does not speak in English; instead, Johnson offers "some precise and some speculative interpretations of the meaning of" his barks. 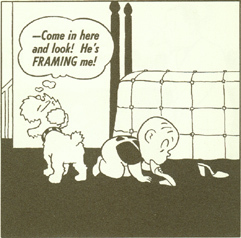 In one panel, Barkis sits inside, howling by the front door, thinking "OOOOOH, TO BE INSIDE! No -- I just came in -- I am inside. OOOOOH, TO BE OUTSIDE!" 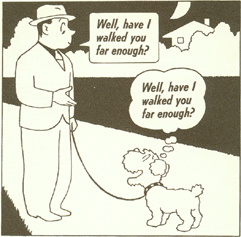 In the cartoon at left, we see Barkis thinking that he's just taken his owner for a walk. In the cartoon at right, Gregory (the youngest in the family) bites a shoe -- an act for which Barkis will likely be blamed.